I have been meaning to write this review for over a year now! I first discovered this moisturizer while perusing black hair care blogs and noticed that it was mentioned several times as an aid in taming new growth. As I currently go up to 16 weeks between relaxers, this cream has been vital in keeping my new growth moisturized and supple. I love the texture of this cream and I really believe this has helped me to grow long and healthy hair. I will be around BSL next month, so I am excited to continue using this product for my next length goal! PS. The customer service is superb and it is very clear that Darcy’s cares about it’s clientele. I was on the search for a moisture based moisturizer for my hair because my hair is married to moisture. I’m relaxed but I stretch my relaxer. This product is wonderful! I never experience my hair being moisturized for days until I met this product!! It made stretching a breeze, and my relaxed hair loved it which is a plus. It’s thick and creamy but is very light on there hair.I will be repurchasing ! wonderful customer service also. Thank you so much! Please don’t stop making this product. 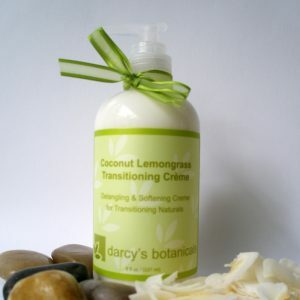 One of the very first products I used when I was transitioning to natural. It made my new growth easy to manage, with the relaxer texture of my hair. The comb just moved right on through my strands. The scent is nice too! Thank you for offering the 16 oz! Please never ever change the formula. This is the best moisturizer I’ve tried and I’ve tried MANY (recovering product junkie)….This has been my staple moisturizer for 2 years….love it. I used this product on freshly co washed hair, while it was damp after i washed my hair. It detangled and softened my hair very nicely, but also moisturized it well too. I also used it on dry hair. I must say i prefer it on dry hair because it detangled, moisturized and softened my hair better that way IMO. It has a very light scent. One thing that i really like about this product is that it really brought out my natural curl pattern. I like that, it actually defined my waves and curls like a curly hair product. I have tried many moisturizers before and none of those products can’t compare to how much definition i have gotton with this cream. i was amazed by that. I’m currently transitioning. I also like it as a daily leave in, this product did exactly what it said it would do. My hair likes it, it soaks it right up. I LOVE this stuff. It did wonders to my new growth. It smells wonderful, I am a 4a-4c and it softened my curls right away. Im newly natural. This transitioning creme makes my hair soft and detangling is a breeze. Smells great , this definitely is a keeper! This product is magic! I am 8 months post relaxer and after washing my hair I add the transitioning cream and instantly I can literally fingercomb my hair..It’s like all the tangles disappear. It’s also a great moisturizer and I love the smell. This is definitely a keeper and I will be ordering more! Thanks Darcy! !